Rhombodera are bigger mantids, who mostly have a distinctive pronotum. Because of their size, they can overwhelm relative huge prey. Because of their aggressiveness, they are not recommended for community- keeping. At present, at least 34 species are described, e.g. Rhombodera crassa (GIGLIO-TOS, 1912), R. flava (DE HAAN, 1842), R. megaera (REHN, 1903) and R. zhangi (BANG & DONG, 1993). 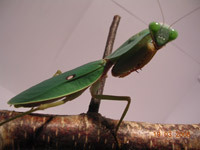 Mantids of this genus is very impressive, but they make big demands in keeping. For a succesfull breeding, they need a big terrarium to create the optimal climate conditions.